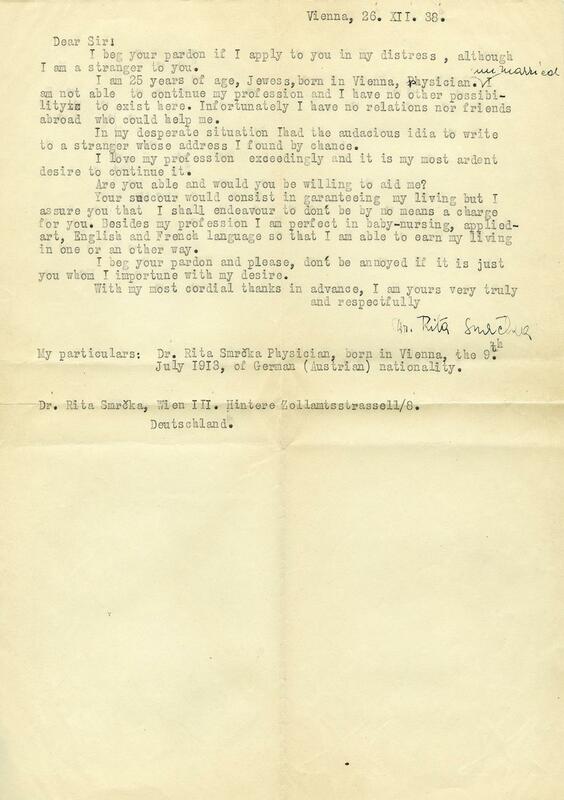 Rita Smrcka: letter written to a Philadelphia pediatrician seeking a sponsor for emigration from Nazi Austria. This 1938 letter, from a 25-year-old female Viennese physician to a Philadelphia pediatrician who was a stranger to her, poignantly illustrates the plight of one person trying to get out of Nazi Austria by any means necessary. The Nazis took over Austria (in an action known as the Anschluss) in March 1938. Rita Smrcka, who was Jewish, was expelled from medical school on religious grounds that fall. 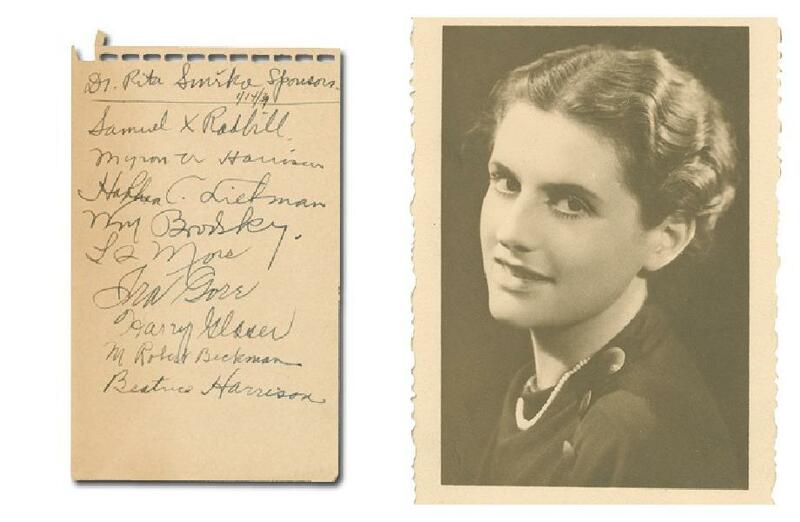 She wrote this letter, proclaiming her love for her profession, her proficiency in other areas (“baby-nursing, applied art, and English and French language”), and her deep desire to leave Austria, to Philadelphia doctor Samuel X. Radbill in December 1938. It appears that Radbill was unable to help Smrcka emigrate, although he wrote a list of potential sponsors on a piece of notebook paper. Many Jewish people living in Austria tried to come to the United States after the Anschluss, with 125,000 applicants appealing to consulates for 27,000 available visas in late 1938. Smrcka went to Auschwitz, where she worked as a camp doctor. This position may have helped her avoid death. She survived the camp and returned to Vienna after the war. Librarians at the Historical Medical Library of the College of Physicians of Philadelphia, which holds Radbill’s papers, found evidence that the 82-year-old Radbill was still thinking of Smrcka in 1983. A letter he received from a colleague that year responded to an inquiry he had made about her status. Thanks to Annie Brogan at the Historical Medical Library of the College of Physicians of Philadelphia. The Samuel X. Radbill Collection, Historical Medical Library of the College of Physicians of Philadelphia. L: Samuel Radbill’s list of potential sponsors. R: Rita Smrcka. The Samuel X. Radbill Collection, Historical Medical Library of the College of Physicians of Philadelphia.